*If you are not already logged in to DealerRater, log in to the Dealer Panel with an account which has administrative access for your dealership. 2) Employees are displayed in alphabetical order by last name. 3) To add a new employee listing, click the “Add a New Employee” button. You can view instructions for adding new employee profiles by clicking here. 5) You can search for a specific employee by using the “Search By Name” search box. 6) The list of employees can be sorted by clicking on any of the column-headings. 7) To view or edit an employee’s profile, click on the employee whose profile you wish to edit. You can view instructions for editing individual employee profiles by clicking here. 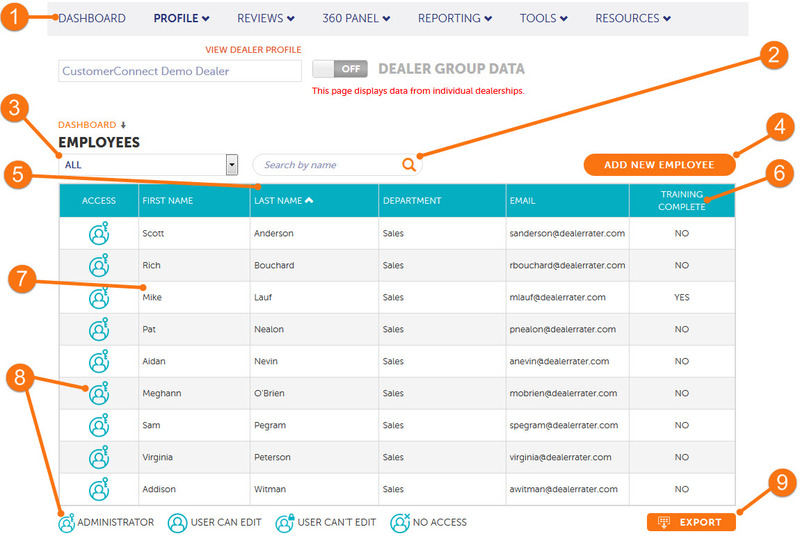 8) Each employee's access level for DealerRater is displayed by the icon to the left of their name. For detailed information about the different access levels please click here. 9) To export your list of DealerRater employees into an Excel file, click the export button; you can export as an XLS or CSV file.